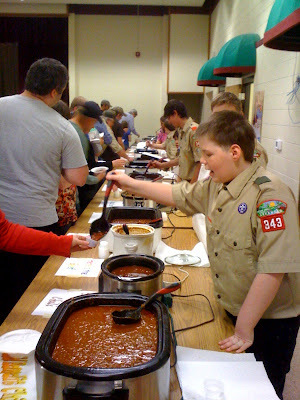 The Elegant Astronaut: Boy Scout Chili Extravaganza! The Boy Scout Troop in Dover, Arkansas, has an interesting fundraiser every year. They host a chili dinner, titled "Chili Extravaganza," where they serve an entire line of chili made from different animals. This year, there was chili made from beaver, deer, elk, raccoon, buffalo, bear, squirrel, antelope, and beef. They also served cake and lemonade, which made for quite a tasty and economical meal for $5, considering you could eat as much as you want. I asked someone why they didn't serve Girl Scout cookies for dessert, and I was told that the Girl Scouts and Boy Scouts "are big rivals here. They don't get along."